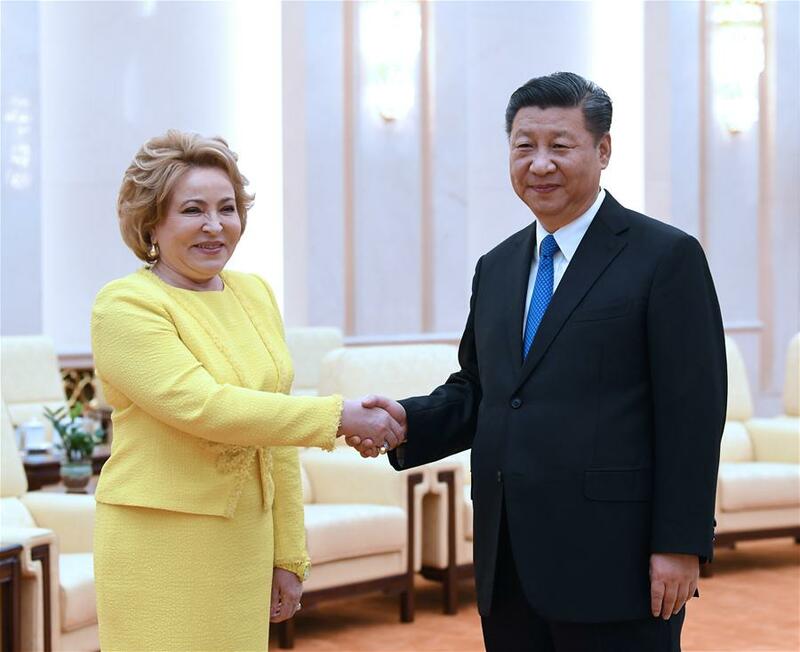 Chinese President Xi Jinping met with Russian Federation Council Speaker Valentina Matviyenko on Wednesday. In the meeting, Xi asked Matviyenko to convey his sincere regards to Russian President Vladimir Putin who paid a state visit to China last month. During the visit, Xi awarded him the first Friendship Medal of the People's Republic of China, which Xi said highlighted the importance and uniqueness of Sino-Russian relations. "I look forward to meeting him again this month during the BRICS Summit in South Africa," said Xi. Sino-Russian relations are at the best stage of history and have set a good example of exchanges between big countries and neighboring countries, he said. This year, both countries have completed their domestic political agendas and have taken steps on the road to national prosperity and revitalization, a solid foundation for stable long-term development of Sino-Russian relations, said Xi. He suggested both sides continue to support each other in safeguarding their core interests, actively participate in international affairs and global governance, and significantly contribute to world peace and stability. Xi expressed the hope that both sides will implement the various agreements reached between himself and Putin, and try new cooperation models. Xi said that cooperation between legislative bodies is an important part of bilateral relations. In recent years, the exchange mechanism between China's National People's Congress (NPC) and the Russian Federation Council has improved, providing legislative support for all-round cooperation and a multi-channel exchange platform, said Xi. He suggested both legislatures enhance learning in governance and supervision, carry forward the spirit of friendship between China and Russia and lay a solid social and public foundation for the development of bilateral ties. Matviyenko conveyed President Putin's greetings and best wishes to President Xi. She said Russia-China ties have achieved a high-level of development under the leadership of the two heads of state. Currently, both sides are implementing the consensuses reached by the leaders, and the legislative bodies of the two sides have an important role in this regard, said Matviyenko. The Russian Federation Council hopes to deepen cooperation with the NPC to strengthen experience-sharing in legislation, promote pragmatic cooperation and beef up coordination within multilateral parliamentary organizations, so as to better serve the overall development of bilateral ties, she added. Sino-Russian relations are at the best stage of history and have set a good example of exchanges between big countries and neighboring countries, said Chinese President Xi Jinping during his meeting with Russian Federation Council Speaker Valentina Matviyenko on Wednesday.